On Holy Saturday we recall that period in which Christ’s body was laid to rest in the tomb, while his soul descended into the hell of the fathers to proclaim the Gospel to those who had died with faith in the Messiah who was to come. The body laid in the tomb was a dead body. The soul of Christ, his human soul, had been given up on the Cross – And Jesus again crying with a loud voice, yielded up the ghost (Matthew 27:50). Christ had truly died and, for those days while his body lay in the tomb, God was dead. Not, of course, that God was dead in his divinity – just as Christ did not suffer in his divinity, but only in his humanity, likewise he died only in his humanity – but it is true that a divine person died. God was dead in the person of the Son; the Father, however, did not die (just as the Father did not suffer). Recognizing the truth that the Eternal Word truly died – that is, his human soul was separated from his human body – by the communication of idioms, we can say that God died (as we can and must say that God became man). Can we go further and say that God was a dead body, and that a corpse was God? St. Thomas Aquinas considers this point in question fifty, article two of the third part of the Summa Theologica. There, he tells us that the Godhead was not separated from Jesus’ body at the moment of death. Indeed, even in death, the flesh of Christ is personally and hypostatically united with the Word of God. The sed contra seems to be the most compelling portion of the article: “On the contrary, As stated above (16, 4,5), the attributes of human nature are predicated of the Son of God only by reason of the union. But what belongs to the body of Christ after death is predicated of the Son of God--namely, being buried: as is evident from the Creed, in which it is said that the Son of God was conceived and born of a Virgin, suffered, died, and was buried. Therefore Christ's Godhead was not separated from the flesh when He died.” If we can truly say that the Lord Jesus Christ was buried, then we must admit that his person was not separated from his body in death. For, in the case of other men, it is only their body (not their person) which is buried; but we state that the person of the Word was buried through the burial of Christ’s corpse. Just as we must claim that God was made man in Christ Jesus, so too we must assert that (for those three days) God was a dead body. As the person of the Word remained hypostatically united to the corpse even after death, it is certain that this dead flesh was God. It is only after we accept that this corpse was truly God that we can then pray to the dead body of Jesus. 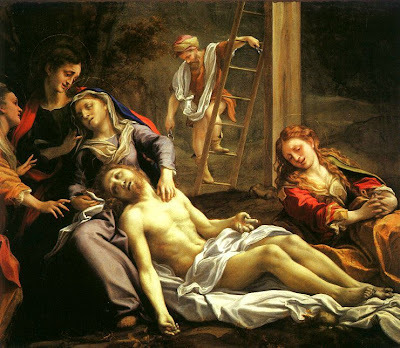 Hence, only when we understand this doctrine, are we able to enter properly into the mystery commemorated on Holy Saturday and in the fourteenth Station of the Cross. I disagree on a couple of points. I wonder if Thomas was ever wrong? I think he was wrong here. I think the body of Christ experienced real death ( the human soul of Christ left the body and because of the hypostatic union, the Second Person of the Trinity, still united to Christ's human soul, left the body also. But God did not die in the sense that Christ's human nature and Divine nature still existed and were still united, though separated from the dead body. God dies only in the sense that Christ's body died. God still lived, the Second Person of the Trinity still lived, the hypostatic union of Christ's human nature and his Divine nature still lived (".. he decended into hell..."). I never thought about all this before and I don't remember any specific Church teaching on these points. We are dealing here with theological speculation and I don't think this is the proper venue for this discussion. Personally, I disagree with most of it. Christ experienced the death of his body but Christ in the hypostatic union of his human and divine nature continued to live ( " ...he decended into hell..."). You said, "I don't remember any specific Church teaching on these points." The Creed: "I believe in Jesus Christ, his only Son, our Lord. [...] He suffered under Pontius Pilate, was crucified, DIED, and was buried. He descended to the dead." We must affirm that Christ died. And, if we can say that, in Christ's conception, God became man; and that, because Mary is the Mother of Jesus, she is also the Mother of God; then we must also affirm that, if Christ died, God died. Nearly everything you say is in agreement with the Church's teaching -- certainly, as God, Christ lived; but, as man, he was dead (for his soul and body were separated). Therefore, we must affirm that, in Christ, through his humanity, God died -- just as God became man in Christ through his humanity. As God, Christ continued to live (in his divinity). As man, Christ was dead (in his humanity). This is really not a matter of great theological speculation. The person Jesus (who is the Word of God, and God himself) "DIED, and was buried." What you have said is also mostly true -- you emphasize that Christ did not die in his divinity, and in this you are correct. I have only stated that Christ died in his humanity. We need not be opposed. Who else is the "author of life" but God? And if they "killed" God, does it not follow necessarily that God died in Christ through his humanity? The Catechism cites St. Thomas' Summa (ST III, q.51, a,3) ... on the state of the body in the tomb. Both of those comments were mine. I stand corrected. It was something the old Baltimore catechism didn't cover and I hadn't read those references in the CCC. Apparantly the point about the hypostatic union requiring a continued, essential union with Christ's dead body and his separated human soul is dogma though I can't follow the reasoning. I will just accept it and think over your references. There is also the idea that one of Mary's titles is "Mater Dei." She is the Mother of God, not only the Mother of Jesus. so, by analogy, if Jesus dies than God also died. This is a little known theological point that is a beautiful part of the Faith. It has very important ramifications too for our salvation. If God ceased to be united to His body, then He did not destroy death. But, because the Life-Giving, Life-Creating Divinity of Christ remained united with His Human Body, He destroyed the power of death for all humanity. We no longer need fear the grave for God Himself has been there and has conquered it! Praise God! Interesting speculation. I would venture to say that, just as God is in sheol as a human soul, so God is in the tomb as a human corpse. Or in other words: Jesus is in sheol and in the tomb. Where is thy sting, O death? On one hand it is shocking that God should be a corpse, even united to a corpse, yet, on the other hand, it is relieving that God should witness (so to speak) to the respect owed to the dead. But that's just my speculations. Thanks for the great reflection! I especially liked how clearly you put this one point: "If God ceased to be united to His body, then He did not destroy dead." To say God died is heresy. Study carefully the teaching of the Council of Chalcedon and the Communication of Idioms. Thank you for that well reasoned and intelligent comment! Jesus died, and is God; therefore, one must admit that, according to the communication of idioms, we must affirm that God (the Son) died in his human nature. If we can say that Mary is the Mother of God, by virtue of her being the Mother of Jesus; then we can also say that Caiaphas and the other Jewish leaders killed God, by virtue of killing Jesus [cf. Acts 3:15]. But, if they killed God, then God was killed. And, if God was killed, then God died. He did not die in his divinity, but in the humanity of the Son. By the fact that at Christ's death his soul was separated from his flesh, his one person is not itself divided into two persons; for the human body and soul of Christ have existed in the same way from the beginning of his earthly existence, in the divine person of the Word; and in death, although separated from each other, both remained with one and the same person of the Word (St. John Damascene, De Fide Orth. 3, 27: PG 94, 1097)." I repeat to say that God who is eternal has died and is dead is a heresy. Such statements at the least are misleading like the old Death of God nonsense in the sixties. You can attribute characteristics of the divinity to the one person Jesus and characteristics of humanity to the one person Jesus. You cannot attribute human characteristics to the divine nature God or divine characteristics to the human nature. To be accurate you can say that Jesus, who is God, died in his human nature. I was delighted to see you take up St. Thomas' treatment of the mystery of the dead body of Christ in the tomb, as the object of my meditation this morning was Thomas' articles on Christ's death and burial! As some of the comments make clear, this is also an oft-neglected subject in modern Catholic thought. The mystery of Holy Saturday, which is part of the paschal mystery, tends to be neglected, and we are often fuzzy on the dogmatic elements. Excellent references also to the CCC, whose section on the Descent into Hell is to my mind very clear and well done. One of the great advantages of St. Thomas Aquinas is that he was writing before the Modern Age -- and thus is not infected by many of the modern heresies. Unfortunately, many people (and I would include you in this) have reacted so strongly against certain modern heresies that they have ended up going to the opposite extreme. Don't allow some post-modern philosopher cause you to abandon the Catholic Tradition. Unfortunately, you are interpreting Chalcedon in a Nestorian (and Calvinist) way, where Christ is an abstract product of the union and the communication idiomatum is a mere exchange of titles as Diodore of Tarsus, Theodore of Mopsuestia, Theodoret of Cyrrus and Nestorius thought.. This is not how John of Damascus, Maximus the Confessor or any of the other major post-Chalcedonian theologians understood the matter. It was rather a transfer of properties or energies. This is in part what made Christ’s live and death unique. He experienced a truly human death but in a divine manner, just as he willed with a human power of willing as a divine person. If we do not say that God died, that the Logos died on the Cross, then a man died for your salvation and you are a man worshipper. The only way out from there will be to say that the value and efficacy of the atonement is not due to the person who suffers and dies, but due to the divine will. If that is so, then we do not need the Messiah to be anything more than Adam since God could have just as easily willed Adam die for our salvation and his death to have universal efficacy. Consequently there is a reason why Unitarianism came after Calvinism. The use of the communication of idioms must be used carefully so that misunderstanding does not occur. To say God is dead or that God died can be misunderstood to mean that the Trinity died or that the Father died or that the Holy Spirit died or that divinity died -that would be heretical. Jesus (who is God) died in his humanity. In the opening lines of the post I said. "Christ had truly died and, for those days while his body lay in the tomb, God was dead. Not, of course, that God was dead in his divinity – just as Christ did not suffer in his divinity, but only in his humanity, likewise he died only in his humanity – but it is true that a divine person died. God was dead in the person of the Son; the Father, however, did not die (just as the Father did not suffer)." Why are you wasting my time, and that of all the readers? You have made your point (in a much less convincing way than I have) ... what more have you to say? The Catechism of the Catholic Church addresses this topic directly: CCC 627. It fully supports Fr. Reginald's points. I agree with all that you have said except for some phrases that you formulated, like "God was a dead body" and "a corpse was God". It is true that the Godhead or divinity did not separate from the dead body of Christ, but to say that "God was a dead body" is already misleading and connotes something different. We can say "God died" or the corpse was "God's body", but not "God was a dead body" or "the corpse was God". We don't say that the eucharistic bread is God, we only say the eucharistic bread is God's body. The corpse and the eucharistic bread is human (not God), it is a human flesh. But it is the human flesh of God. Lastly, when we pray to the dead body, the formal object of our prayer is not really the dead body, but the person of Christ Himself. I think that is what precisely in St. Alphonsus' mind. In the same way, when we pray before the blessed sacrament, the object of our prayer is not the consecrated bread (flesh of Christ) itself, but His person. Fr. I believed that what I have said here are also what you mean by the phrases you made in your article, but it is important to point out the misleading connotations those phrases can have. I agree that you and I are trying to say the same things ... the major difference is of emphasis and not of doctrine. Still, you simply cannot say "We don't say that the eucharistic bread is God, we only say the eucharistic bread is God's body." Moreover, the following line is even worse: "The corpse and the eucharistic bread is human (not God), it is a human flesh. But it is the human flesh of God." You seem to be falling into a type of dualism ... the Person of the Word is hypostatically united to the humanity. Therefore, the humanity really is the Person of the Word. The human nature subsists in the person of the Word. The human nature has not separate act of existence other than that which it receives from being assumed by the divine person. In other words: As soon as we separate the humanity of Christ from his divine person, the humanity ceases to exist. However, as is clear in my article, by "God", I am denoting not the essence or nature, but the person ... Jesus is a Divine Person, he is God. He remained hypstatically united to the dead corpse ... therefore the corpse was Jesus, and it was God. When it comes to the Eucharist, I need not even mention the fact that the Divinity of Christ is truly and really present ... it is enough to say that because Jesus is God, and the Eucharist is Jesus (even substantially), then it follows that the Eucharist is God. The Eucharist is not the divine essence, nor is it the Father or Holy Spirit; it is God the Son. But, since the Son truly is God, and Jesus is truly the Son, and Jesus is truly the Eucharist; it follows that the Eucharist is God. Just as it follows that the man Christ Jesus is God (according to his person). If the man Jesus Christ were not God and could not be called God, then St. Peter could never have said: "You put to death the Author of Life." If your reasoning were correct, St. Peter would have had to say, "You separated the human soul of God from the human body of God, not killing God but rather killing the humanity which God had assumed." But Peter did not say this, because he was not a heretic. In truth, I find your radical separation of nature from person to be very troubling ... it smells like Nestorianism. You write as though the flesh of Christ (either in his proper species or in the eucharistic species) could somehow be separated from the Divine Person of the Word and made a person unto itself. This is why I chose the somewhat provocative title for the post -- to root out any remnants of the Nestorian heresy. I agree with your observations that my way of explanation may sound like a type of dualism close to Nestorianism, as several others have already pointed out. But as you said already, the problem lies in our emphasis. I tend to emphasize the separation of the two natures in order to correct the lingering idea which confuses or merges the two natures to the point of asserting that even the divinity suffered and died. Thus, my explanations may be misleading, but they need not for those who correctly understand the doctrine. I agree with you that Christ is only a single being. This is very clear in our metaphysics lesson. And that Christ's humanity has no act of being save in His divine Person. However, let me emphasize too that Christ has a human personality also. Phenomenologically and psychologically speaking, Christ is a two persons (one Divine and one human). Meaning, He has a human personality because he has a human consciousness, flowing from his human intellect and will. Also, I believe both statements are correct: 1. What was killed was only his humanity (or what died was the human body only). 2. Christ died, God died, the "author of life died". I don't see any contradiction in them. I don't see any reason why you should oppose them. St. Peter could have said them both. Peter could have said the first one if he is to explain the doctrine in precise terms. It is true that we attribute death to the person because the person is the ultimate end of attribution. But we can also attribute death to the nature. That is what I mean. Let me emphasize that when I attribute things pertaining to Christ' human nature only, I do not mean that Christ' humanity is also a person (in metaphysical terms). Metaphysically (which is different from psychology) Christ is only a single person, albeit he has a human personality too. And so, even if we attribute human acts to Christ’ human agency (human intellect and human will) it should not be interpreted that we accept that there are two hypostasis (persons) in Christ. So, as you can see father, the type of dualism which is observable in my explanations is not Nestorian dualism which claims that there are two hypostases in Christ. The dualism lies in my emphasis that the actions of Christ are first attributed in his human agency, which is truly a human personality – it is truly human “self” or “I” or “ego” as understood in psychological terms. Thus, when Christ said, “Father, not my will but yours be done”, he was speaking as a truly human “self” – a truly “human person”, to speak in psychological terms. So I disagree to an extent with your statement that "the humanity really is the Person of the Word". In my understanding, there is quite a difference with our substantial unity compared to Christ. In ordinary human beings, the body really is the person, but we cannot say this univocally with Christ. Our philosophy of man, is to an extent, not completely applicable to Christ. The reason for this is because while our human personality is identical to ourselves, to our person or hypostasis, it is not in Christ, because he don't only have a human nature which subsist in His person; His nature is also truly and uniquely a human personality, but not a unique hypostasis or person (metaphysically). This, I think, is the type of dualism which is often ignored in discussions pertaining to the Hypostatic union. If I cannot say that the body of Jesus (whether alive or dead) is God, then I cannot say that Mary gave birth to God -- I would have to say she gave birth to the human body of God. But then, I am speaking of the body as though it is a substance unto itself, existing in/from itself ... hence, I would be saying that it is a hypostasis. No, this line of reasoning is wrong! The Church prays to the body and the soul of Christ: Soul of Christ, sanctify me; body of Christ, save me. And she can pray this way only because the soul and body of Christ really and truly are God, by virtue of the hypostatic union. You bring up the human person: I am my body, and my body is me. Mary is the Mother of God, not merely the mother of the body which God assumed. The Eucharist is God, not merely the body and soul which the Son assumed. Certain men crucified God, not merely the body of God. And Jesus said, "I thirst" ... he did not merely say "My body thirsts." Jesus is his body, and Jesus is God; therefore the body of Jesus is God. Thanks father for your patient response with me. I guess this will be my last reply. As I have said, both statements are correct. They can both be said within the limits of the rules of the communication of idioms. So the statement "Mary gave birth to the human body of God" is as true as the statement "Mary gave birth to God". The former will only be wrong or heretical if it is understood in denial of the latter, that is, if to say it is to admit that the human body is also a human hypostasis as Nestorius claimed. But if the former is understood in consonance with the latter, then it is a correct expression. The former often comes out as an explanatory statement of the latter to prevent misconstrual. So, I find it unacceptable that you seem to think that the two are mutually exclusive. I disagree with the inference. We can say that Mary give birth to God but we cannot say that the body of Jesus is God; because when we say Mary gave birth to God, we don't refer to His body but to the person who was born of the Virgin Mary. Hence, we say Mary gave birth to God. But when you say the body of Christ is God, the statement is not anymore referring to his person but to the body itself. And it is wrong to say that the body is God (but of course I understand that you are not saying that the body is divine). //I am the body, and the body is me//, this is true to us ordinary human persons, but I find some difficulties if this is applied to Christ. The human personality of Christ can say to His body "I am the body, and body is me" as anyone of us can. But regarding the Divine Person (Logos), there must be some reservations or nuances. After all, we in fact sometimes say "the human intellect of Christ even in the state of glory does not comprehend totally Himself (Divinity)". This statement sounds even more dualistic than my statements, but we do use this as a correct expression, right? This is in fact the basis why some theologians raise the question whether Christ is conscious of His Divinity. They are referring to His human consciousness (personality) - whether this human consciousness is conscious of His Divinity. Some apologists, I have observe on the net, react and say that to ask whether Christ is conscious of His divinity is a blasphemy, because for them, it is absurd that Christ, being God Himself, should not be conscious of his divinity. But I think, they only failed to grasp the entire point of the question owing to the defect of their understanding of the dogma. They think that the self of Christ, His consciousness which Mary, the apostles, and His disciples relate with, is the Divine self or the Divine Personality. But this is wrong, because Christ, who walked at the Jerusalem land, was a true man. He has a complete human nature, which means that he has a human consciousness, a human self, a human I or ego. This human consciousness is the one that is being referred to by dogmatic theologians. They ask whether this human consciousness was conscious or aware of His divinity while still young. If this human consciousness is not totally conscious or does not totally comprehends His own divinity even in the state of glory (in heaven), then, the theologians ask, whether it was also conscious of His divinity while still in the womb of Mary. The answer of some theologians is that it was conscious by virtue of an infusion of knowledge. //Jesus is his body// is true. However, the "his" here does not refer to the Divine personality but to the human personality. The mistake which I recognized among many is that they think that the consciousness (self, ego, or I) of Jesus speaking and relating to the people of His time is the Divine consciousness. But this is very much mistaken. If this is the case, then that would jeopardize the Church's entire understanding of the Immutability of the Divine consciousness (Intellect and Will) which is numerically common among the Trinity. If that self speaking to the apostles is also the Divine consciousness, then that would mean that the Trinity is speaking in them, since there is only numerically one Divine consciousness. So my conclusion father is this: The church condemns dualism in human person - an attempt to separate the person from his body (because it has serious ethical implications). But this condemnation of dualism should not be construed as if it also applies to Christ's human nature and Divine Person. I can remember some authors speaking of the difference of unity in human persons and the unity of the second Divine Person with his human nature. The Hypostatic Union is greater and closer than the union of body and soul, as Thomas taught; but I guess it means something different, and the inference that you have made from it may not be correct. My last words father: I believe, as you have already said, that we don’t differ in doctrine but only in our way of articulating it. If my expressions still appear to you to be savoring Nestorianism, rest assured that I am definite in my rejection of Nestorianism. I guess, all I have to do now is to review about this topic to polish my understanding, and thus, be able to articulate it with more accuracy. Well, it is clear that our debate is much more about the means of articulating metaphysics than about a difference of belief. I will say that it is clear that you have a good foundation in philosophy ... still, I would say that the discussion of a human personality and divine personality in Christ is a very tricky topic; one not to be discussed too lightly. In any case ... the key point I have been making is that, by "God", I refer not to the divine essence but to the Person of the Word ... therefore, it is most certainly true to state that the corpse was God, since the Person of the Word remained hypostatically united to it. Your point (which boils down to the assertion that there are two natures in Christ) is also well taken. However, you went too far in affirming that we cannot say that the Eucharist is God or that the corpse is God. The "Bright Maiden" Julie @ The Corner With A View posted a poem that goes with this post, Reginaldus.